On Thursday, Marchand scored the winning goal — on the penalty kill — for Team Canada, as it fought back to win Game 2 of the World Cup final by a score of 2-1. Patrice Bergeron and Marchand scored 2:09 apart late in the third period, as the Canadians came back to stun Team Europe, which had controlled a good portion of Thursday’s game. "This is an extremely exciting day for me and my family," said Marchand. "I would like to thank the Jacobs family, Cam Neely, Don Sweeney, Claude Julien, the coaching staff, my teammates and our fans for their continued support and belief in me. I have been a Bruin since the start of my pro career and there is no place I would rather play. I look forward to doing everything I can to help our team achieve success and bring the Stanley Cup back to Boston." 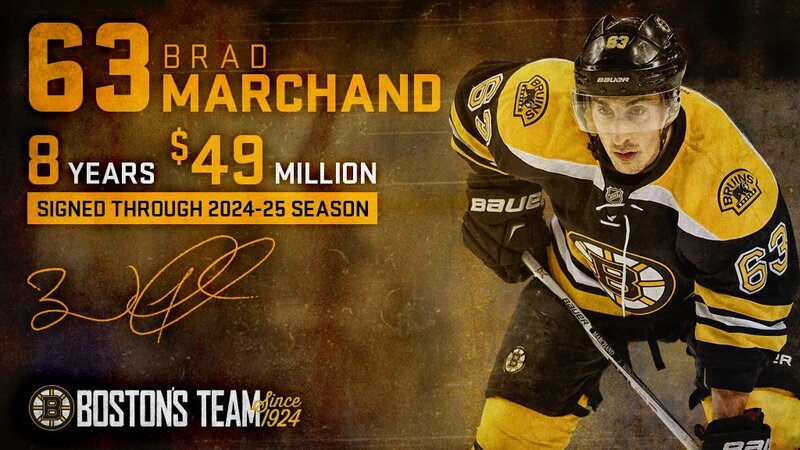 BOSTON, MA - Boston Bruins General Manager Don Sweeney announced today, September 26, that the team has signed forward Brad Marchand to an eight-year, $49 million contract extension through the 2024-25 season worth an average annual value of $6.125 million. ©2016 Brad Marchand Official Website. All rights reserved. | Your Sports Marketing Group Inc.